There’s something very special about The Fountain Inn. 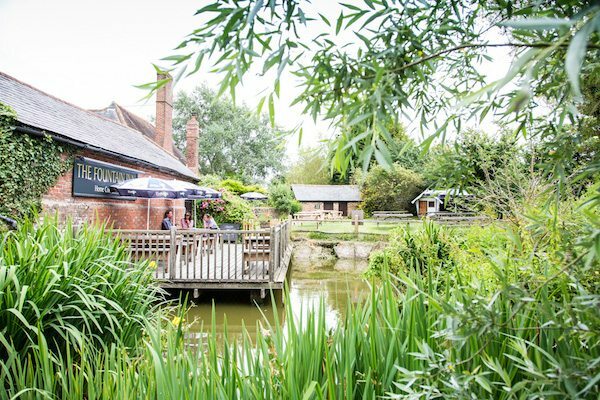 Located in the small and pretty village of Ashurst just north of Steyning in West Sussex, The Fountain is a stunning 16th century, Grade II listed converted farmhouse set in picturesque gardens. As the only pub in the village, The Fountain caters to a mix of well-heeled local residents and visitors from further afield. Over the years it’s attracted praise and attention from some interesting quarters: author Hilaire Belloc praised the inn and its beer in his 1902 novel The Four Men: A Farrago; then in 1979 Sir Paul McCartney immortalized The Fountain on screen when he used it as the setting for the music video to his pop hit “Wonderful Christmastime”. Even esteemed actor Sir Laurence Olivier was a fan; The Fountain was his favourite watering hole when he lived just south of Ashurst. 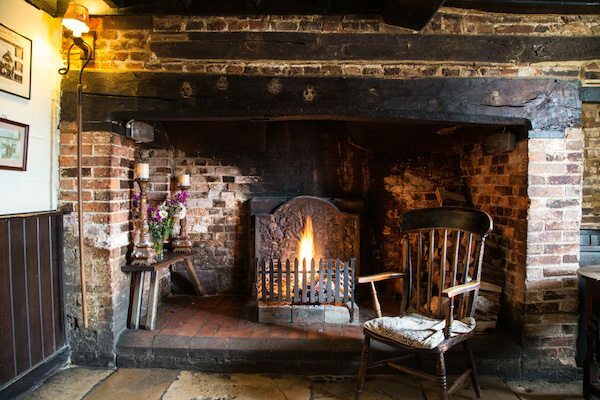 Such acclaim is no surprise when you step inside – the pub is imbued with character and history, with interlinked bar and dining areas, low ceilings with wooden beams, wonky floorboards, flagstone tiles and an inglenook fireplace. 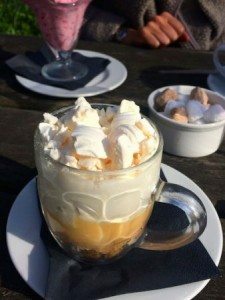 All of these features help to create a warm and convivial ambience, which General Manager Alex Tipping considers of utmost importance in a village pub and therefore strives to retain. 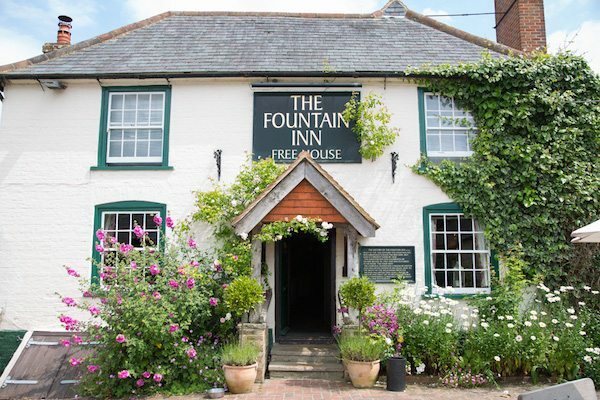 The inn’s surroundings and rural location close to the Downs guarantee that The Fountain’s a popular spot in the summer and rightly so – the gardens are a lovely place to enjoy lunch on a sunny day, as my friend and I discovered one recent Sunday. Looking through the menu we were impressed by the ample choice. 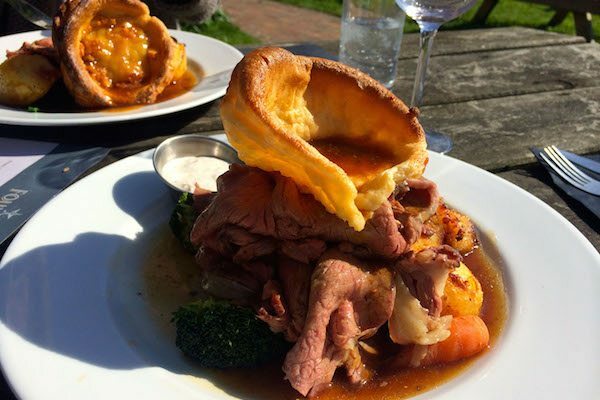 Whereas lots of pubs or restaurants limit their menus to just roasts on a Sunday, The Fountain menu is more extensive. 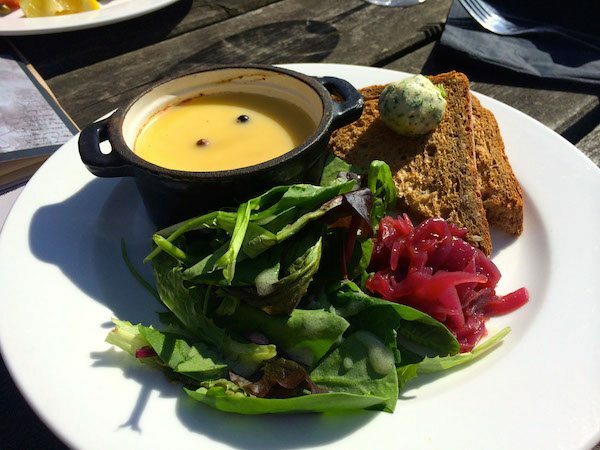 There are bread and oils to nibble on as you choose your dishes, four starters, a staggering nine main dishes as well as roast beef, lamb or nut loaf for the vegetarians. The food is clearly aspirational – more bistro than standard pub fare with something to suit everyone. The use of local produce and a respect for seasonality is liberally present throughout the menu, which I found reassuring, and with so much choice it took my friend and I a while to decide. For my starter I went for the chicken liver, gin and juniper parfait with malted toast and dressed leaves (£7.50). 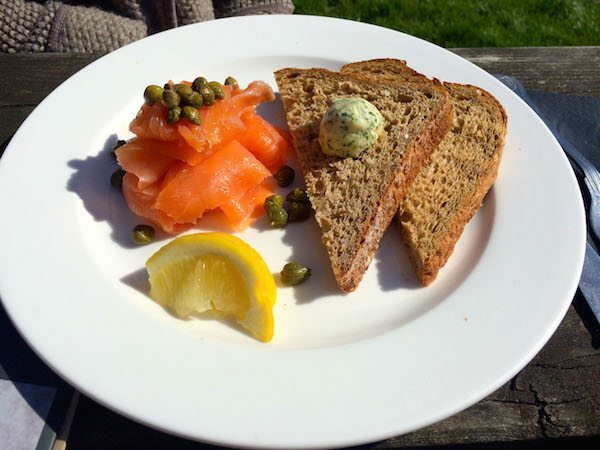 My friend, meanwhile, chose the smoked salmon with malted bread, capers and herb butter (£8). When our starters arrived we were both impressed with the quality and quantity of the food. My chicken liver parfait was an incredibly generous portion – slightly too much, perhaps – with a delicious taste and creamy texture. The addition of gin and juniper made the flavours much more complex on the tongue; deep, rich and earthy from the chicken livers but with lighter, fruitier overtones which I enjoyed very much. My friend’s salmon had been smoked locally and was an equally decent amount of food for the price. Thick, unctuous slices of fish had been heaped into a mound and scattered with capers, served alongside two slices of granary toast with herb butter and a wedge of fresh lemon. The salmon was a lovely colour – not too pink – and the smoked flavour was enticingly gentle rather than overpowering. A classic dish executed simply but well. With our appetites whetted we sipped our rosé wine and enjoyed being outside on such a glorious day. For our main courses we’d both plumped for the roast sirloin of Sussex beef with a yorkshire pudding, seasonal veg, gravy and horseradish and again, as with the starters, were pleased with what we saw when our plates arrived at the table. The food had been piled high on the plate – carrots, broccoli and cabbage beneath thick slices of pink and tender beef, crispy roast potatoes, gravy and a giant homemade yorkie. We both tucked in ravenously. The local Sussex beef was gorgeous – flavourful and soft and not at all sinewy or too fatty. A great sign that the kitchen can handle meat with confidence and care. The vegetables had been cooked al dente, which I prefer, and the potatoes were soft and fluffy inside with a crunchy exterior. If I were to make any criticisms it would be that the gravy was a tad too thin for my liking. It had a good taste but could have done with being a little bit thicker, in my opinion. All in all though we were both delighted with our roasts. The main components of the dish, such as the beef, the potatoes and veg and the yorkie were all excellent and we felt very satisfied during and after the meal. Too satisfied, perhaps, for a pudding but Manager Alex insisted we try the Eton mess and the lemon meringue and we didn’t feel able to refuse! Both desserts were colourful, sweet and light. As we dipped our spoons in to take our first mouthful, a couple on a neighbouring table told us how much they loved the desserts we were eating, so The Fountain clearly keeps its customers happy and fulfilled. I don’t have much of a sweet tooth and was already full, so I didn’t manage to finish my lemon meringue, but both puds rounded off our meal very nicely; neither was too rich or heavy but were instead fun and light. After our desserts we spent some time relaxing and chatting to Alex the manager. He’s a man who’s committed and focused on The Fountain’s success and passionate about his keeping people well fed and watered. His knowledge of food and wine is also top drawer, so I recommend you tap into that font of knowledge by whiling away a pleasurable few hours at the inn. Hilaire Beloc and Sir Laurence Olivier obviously had good taste and, fortunately for us, standards haven’t slipped.